Update: The Election on April 7, 2015 recorded 551 votes cast regarding the SBD. 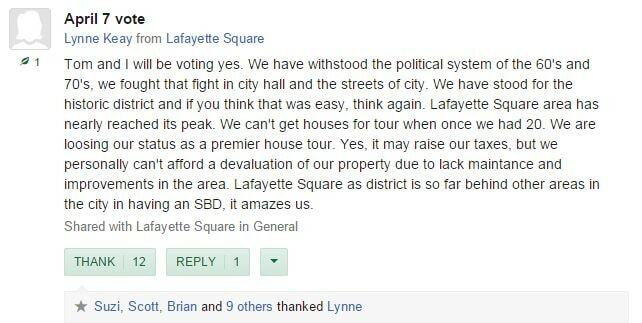 This page will remain visible as a reference while the residents of Lafayette Square reconsider our options for neighborhood initiatives. 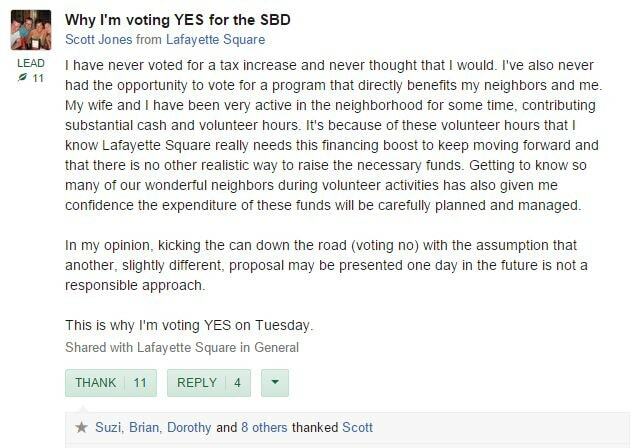 See why some of our neighbors voted *YES* on April 7th. A group of Lafayette Square residents has been working throughout 2014 to propose and promote the idea of a Special Business District (“SBD”) for our historic neighborhood. The SBD would provide much-needed funding for maintenance, safety initiatives, and capital projects. SBDs are in place in many other St. Louis neighborhoods (Soulard, the Central West End, the Grove, etc.). The funding mechanism relies on an incremental increase in property taxes on all properties, not just businesses; the term SBD is a bit of a misnomer in that way. Community meetings were held in September 2014 and October 2014 to serve as public forums during which the SBD Study Group made a fact-based, formal presentation followed by a Q&A session. The Powerpoint presentation used at the meetings is posted on this page for your reference. The meetings were facilitated by St. Louis public policy experts Laura Lock (in September) and Mack Bradley (in October). Both Ms. Lock and Mr. Bradley work with SBDs in other neighborhoods. We estimate that over 150 people attended these meetings, and we are grateful for their input. The SBD Study Group committed to sharing information openly on this concept. This webpage will serve as the home for all pertinent information on the proposed SBD. We will keep it updated as information arises on the SBD effort. Thank you for your interest in this proposal! Why do we, as a neighborhood, need to raise more money? Great question! Despite impressive progress in many visible areas, the Lafayette Square neighborhood is suffering from decades of deterioration, under-investment in neighborhood infrastructure, and the city’s shrinking tax base and budget shortfalls. Many of the neighborhood’s standout successes have stemmed from the valiant efforts of individual residents and businesses to restore and develop individual properties and features. Much of the neglect and deterioration, however, is associated not with individual properties but with public infrastructure features that affect quality of life, continuing development prospects, property values, and the neighborhood’s long term vitality. The city of St. Louis will continue to be responsible for city-wide public infrastructure components, including streets and sidewalks, refuse collection, and many other key areas. But like most other major cities nationwide, St. Louis is facing chronic revenue and budget shortfalls of its own, and has been reducing its financial support to city neighborhoods for years. Beyond basic infrastructure support, the city will not be a source of substantial funding for the Lafayette Square Urban Plan improvements or for meeting our other neighborhood-centered improvement needs and obligations. Lafayette Park in particular, while it has benefited from tireless volunteer efforts, has a fragile infrastructure, including the ornate 1869 iron fence, the imposing gateway fixtures, the lake and fountain systems, the walkways and lighting, that is increasingly at risk. The entire park, which could easily be a gem-like destination for residents and outside visitors alike, suffers from chronic deferred maintenance. These problems will cost millions of dollars to fix and are far beyond the scope of the most dedicated volunteer efforts. Every year the historic district’s maintenance costs alone require funding that is equal to about what the LSRC can raise in a good year. (For the last several years the LSRC has had more expenses than revenue every year.) Neighborhood safety and security add another layer of unresolved challenge that will be expensive to deal with. And in the past 14 years, critical new items have presented themselves for addition to our to-do list. In an era of increasingly constrained city budgets, there are still millions of dollars of critically-needed infrastructure projects and improvements, deferred maintenance, and safety and security measures for which no funds are available, or likely to become available. In 2001, as part of a sustained community effort led by an urban planning team from Washington University, Lafayette Square residents and business owners developed and secured City of St. Louis approval of an Urban Plan for the neighborhood. A key part of the plan was a To-Do List of critically needed neighborhood improvements that would ensure the long term viability of the Square’s often-fragile infrastructure, recognize both its unique heritage and its contemporary urban culture, support intelligently-planned future development, and enhance the quality of life in the neighborhood.